Love With A Passion Called Hate! In 50 seconds Jack White says more about the challenge facing artists on the verge of success than I have managed in 20 years of being let down, and I hate him for it. I hate the White Stripes 'cos they make me do things I never thought I'd do again, like flailing my arm windmill Townshend-like, Machine Gun Wilko/Andy Gill psychotic stare, Strummer clenched fist aloft, Weller psycho chicken strut, and that gets very embarrassing on the train going to work when I am listening to White Stripes. I hate the White Stripes because on paper it doesn't work. Raw rocking blues are confined to the dustbin of history, and a brother and sister duo ain't capable of creating such a beautiful, righteous racket in the twenty first century. I hate the White Stripes because I hate the Blues. I hate people who like the Blues, and I hate the White Stripes because they make the Blues come alive and get me wondering about what I'm missing, and that's dangerous because I spend enough on records as it is without starting in on the Blues. I hate the way the White Stripes rip it up on 'Hotel Yorba', in a way no-one's managed since The Clash knew their rights, and I hate the White Stripes because they make me mourn the loss of my Panther Burns' early Rough Trade sets, and in particular Agitator Blues (is that the one that includes a bit of 'Howl'?) which Bobby said was really me. Mind you, I'm still trying to work out what he meant about me liking Tim Rose because he looks like a labourer. 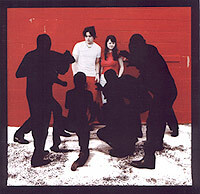 I hate the White Stripes because the ferocious, excoriating raw roar of 'Fell In Love With A Girl' reminds me that in March 1985 the Jasmine Minks recorded 'Forces Network', 'The World's No Place', 'What's Happening' and 'Black and Blue' in one weekend, and the record company man never had the vision or guts to put all four songs on one 7" record, but then the man in a millionaire and I'm shuffling paper for a living, listening to the White Stripes as I go to work. I hate the White Stripes because 'We're Going To Be Friends' is so sweet, and it makes me think of school summer holidays, out playing by the river, cycling home to hear that Showaddywaddy and Cockney Rebel were in the charts for the first time, and there's no cynicism or irony in that beautiful song, and I doubt if even Jonathan Richman or Ray Davies managed that so well. I hate the White Stripes because 'I'm finding it harder to be a gentleman' makes me think of s beautiful feature I read by this young hip hop fan who said she felt intimidated by the macho posturing of rap's major players until she stumbled across Gang Starr in a basement somewhere and discovered a whole new energy without any of the negatives, then think of the power of 'Lovesick' on Step In the Arena, and I wish I could have seen Gang Starr in a basement somewhere. I hate the White Stripes because rather than thinking of the Fall's Grotesque, I should be approaching this noise without any baggage, and just soaking up the power of this magical popstorm. I hate the White Stripes because the LP is dedicated to Loretta Lynn, and I've lost my Loretta Lynn records, and the record shop's got none. God, I hate the White Stripes. Rave on Meg and Jack, and keep those dreams burning!